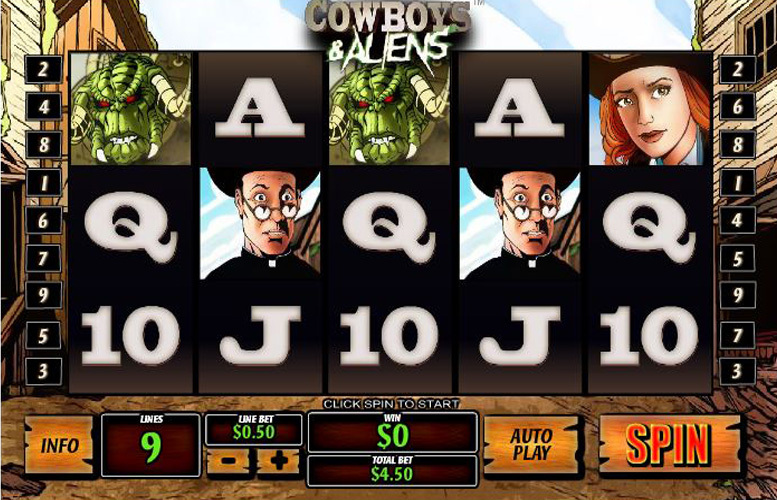 The Cowboys and Aliens slot is based on the comic book of the same name. Of course, there was also a movie made after the comic, back in 2011. While Daniel Craig and Harrison Ford may have carried the movie, it was still pretty mediocre otherwise. At least from the critics’ standpoint. But we’re not here to review comics or movies – so let’s see if the slot game holds up to its wacky name. 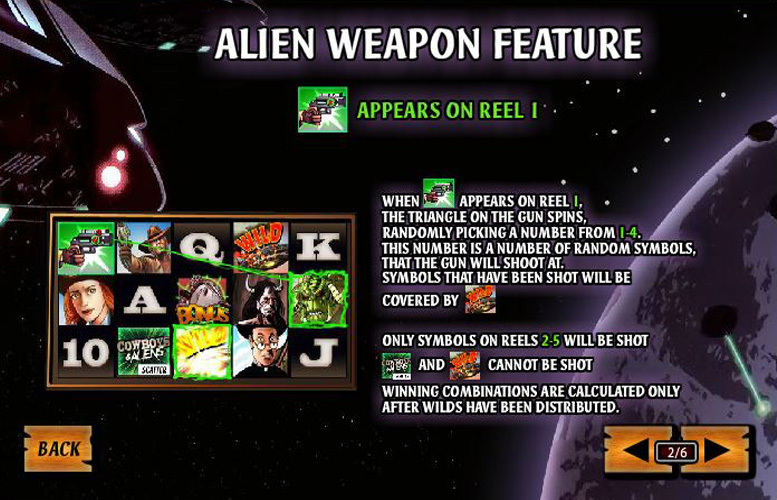 Alien Weapon – This symbol can appear on the first reel only. When it does, a random number from 1 to 4 is selected, and the weapon randomly shoots symbols on reels 2 through 5. Those become Wild symbols and award you with a massive win. Alien Bonus – This symbol can appear on reels 1 and 5. 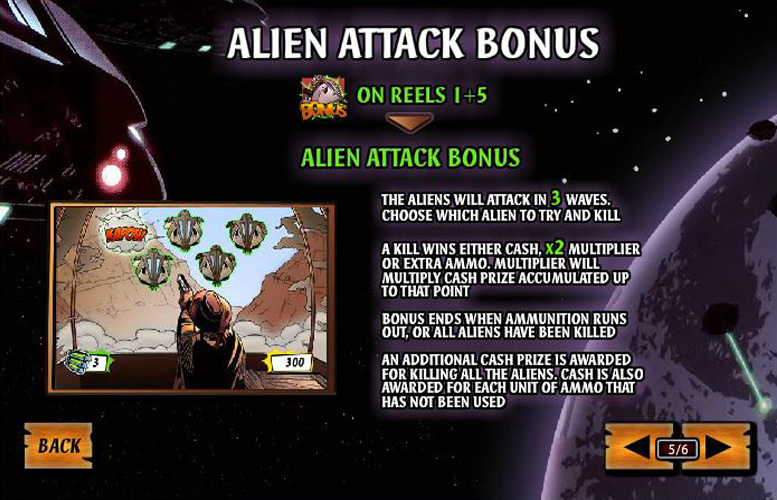 When they appear on both at the same time, the Alien Attack Bonus game is activated. You can choose to play with Zeke, Verity, or the Indian Warrior. Each of them has a different weapon with various levels of accuracy and ammo. You shoot, whip, or poke the alien ships with arrows for three waves for some big wins. Cowboys and Aliens Scatter – By landing three of these symbols anywhere, you activate 8 free spins. The interesting aspect is that each spin a random comic strip rectangle will appear on the reels. Its size ranges from 2 to 6 squares, and each of those squares will act as a Wild. The comic strips are beautifully animated. What you should note is that you can’t trigger any other bonuses during the free spins. Can’t have a Playtech slot without getting your dose of Poker Card symbols. 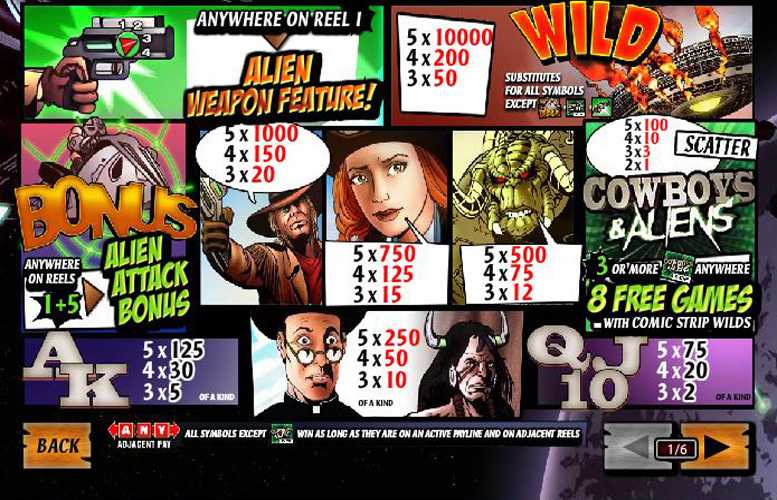 Cowboys and Aliens slot is no different, so expect to see 10s, Js, Qs, Ks, and Aces among all the others. Naturally, they’re less valuable than the rest. The main heroes of Cowboys and Aliens are present as regular symbols. Zeke (the cowboy) is the most valuable at a max 1000 coin win, while Verity (the cowgirl) can rack up to 750 coins. There’s also the Preacher and Indian Warrior symbols which are worth only up to 250. And, since this is not “Cowboys and Indians” – we have an Alien symbol as well, worth up to 500 coins. The rest of the symbols (Alien Attack Bonus, Wild, Scatter, and Alien Weapon) have already been discussed above. No use repeating what has already been said. Maybe just a reminder that 5 Wild symbols in a row win you 10,000 coins. If you like your steaks well done but your stakes to be high, you’ll like the Cowboys and Aliens slot. A betting coin can reach up to $100, so the maximum bet per spin is $900. Even so, the minimum coin value is $0.01 – casual players will not feel left out of the fray. The max bet may not seem that high, but remember that the top Jackpot is 10,000 coins. Quite simply, the Cowboys and Aliens slot exceeds all expectations when it comes to games of this category. The visuals and music are high quality and really get you in the mood. The Jackpot is high, and the bonus games are exceptionally made. 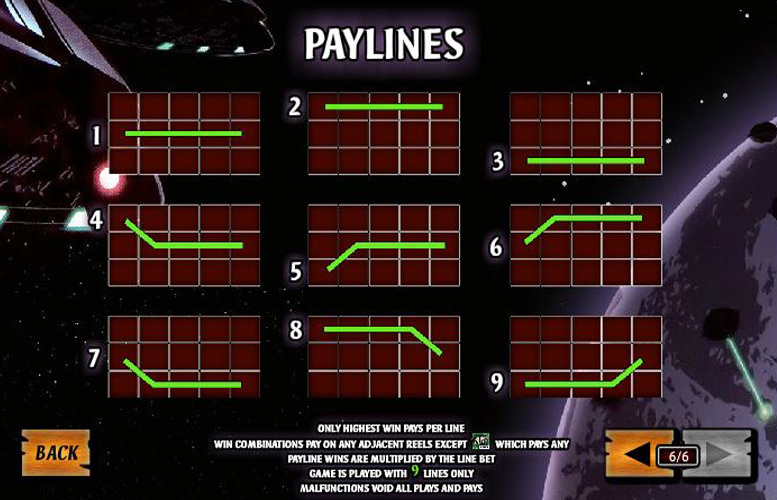 We can even overlook the fact that it only has 9 paylines. With so many bonuses ready to rear their head at any occasion, you don’t even need that many to stack up a nice wad of cash. If only that Alien Attack Bonus game had been a little better animated. Oh well, we can’t be picky – it’s not a AAA game title, after all. This game has a rating of 5 / 5 with 378 total reviews by the users.